The Cycladic-style Hotel Kafouros is located just 100 meters from the beach of Kamari and 10 minutes by car from Fira. 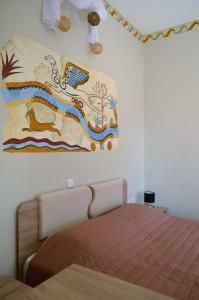 Studio with simple décor, a kitchenette with a refrigerator and kitchenware, and a balcony overlooking the Aegean Sea. Includes free Wi-Fi. This Cycladic-style room has a romantic lighting of lanterns. It includes a balcony with panoramic views of the Aegean Sea and free Wi-Fi.